The Italian government after its swearing in ceremony in February 2014. 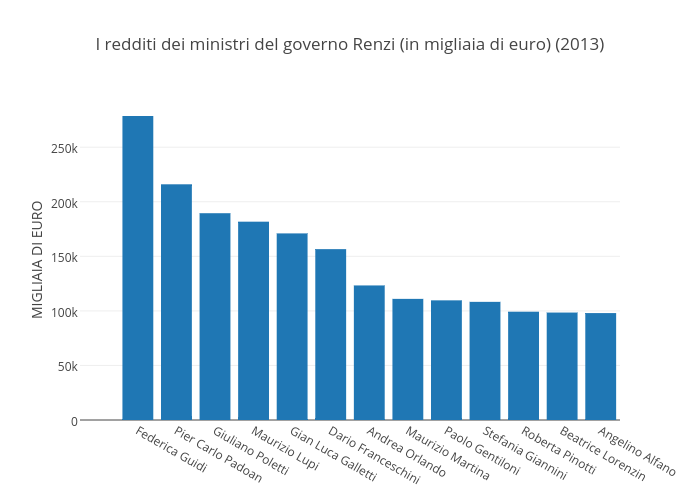 The incomes of Prime Minister Matteo Renzi and his cabinet have been published online, as part of the premier's broader push for transparency within the Italian government. The earnings published on Friday relate to 2013, before the politicians were part of Renzi’s cabinet which was formed in February last year. The current prime minister previously served as mayor of Florence, earning €99,000 in 2013. Renzi also declared owning two properties in the Florence area, a garage, and part ownership of an olive grove. His wealthiest minister was Federica Giudi, charged with overseeing Italy’s economic development, who in 2013 earned €279,000. Her assets included numerous part or fully-owned buildings in Italy, while Guidi also stated she was in the process of transferring investments in foreign energy companies. Finance Minister Pier Carlo Padoan was revealed as the second-wealthiest cabinet member, declaring an income of €216,000. In 2013 he owned an apartment in Rome, a garage, and drove a Mercedes. At the other end of the scale were Maria Elena Boschi, minister for constitutional reform, and Marianna Madia, minister for public administration and simplification, who both earned just over €94,000. Interior Minister Angelino Alfano topped this figure, declaring €98,000, a few hundred euros less than Health Minister Beatrice Lorenzin. Roberta Pinotti, defence minister, earned just over €99,000 in 2013. Cabinet members who declared more than €100,000 included Foreign Minister Paolo Gentiloni (€110,000) and Education Minister Stefania Giannini (€108,000). Among the higher earners was Giuliano Poletti, labour minister, with an income just shy of €190,000, and Transport Minister Maurizio Lupi (€182,000). Dario Franceschini, minister for culture and tourism, earned €157,000 in 2013, while the same year Justice Minister Andrea Orlando has an income of €123,000.